On the 4th March 1958 the MV “British Monarch” was discharging a bulk cargo at the port of New Plymouth, New Zealand and two apprentices took some shore leave. They went to the nearby beach for a bit of sun bathing and to admire the local talent. Shortly after they reached the beach they noticed two girls had strayed too far into the water and were out of their depth and clearly in distress. The two apprentices ran to their assistance, both of the girls were saved but one of the apprentices who could not swim, Robert Ian Cramman, drowned. He had lost his life trying to save another. This was a devastating loss to a closely knit crew, who, less than a year earlier, had safely rescued their 2nd mate lost overboard in the Pacific for over nine hours. (Read “A day to remember”). We buried our young hero in the cemetery overlooking the port with the whole crew in attendance and representatives from the local community including the Port Captain. His belongings were returned in his kit bag to his loving parents Mr. & Mrs R. P. Cramman of Gourock Scotland. I was the Radio Officer on the “British Monarch” at the time and fifty years after this tragic accident I was able to return to pay my respects to our brave young hero. I went there with my family including my grandchildren. 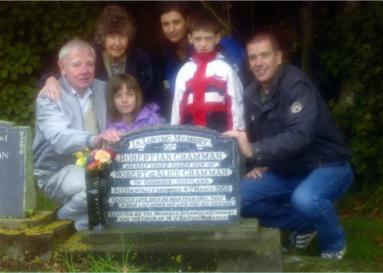 I am pleased to show some photographs to show he is remembered and his deeds clearly shown. I should also like to mention the help I received from the Liverpool Retired Merchant Seafarers who were able earlier, through their world wide network, to locate and obtain a photograph of the burial site with its inscription. This enabled me to complete my story about this very brave lad. I also include a photograph of the original funeral party. He is also mentioned on the New Plymouth District Councils Burials web site. The port is now known as the Port of Taranaki. 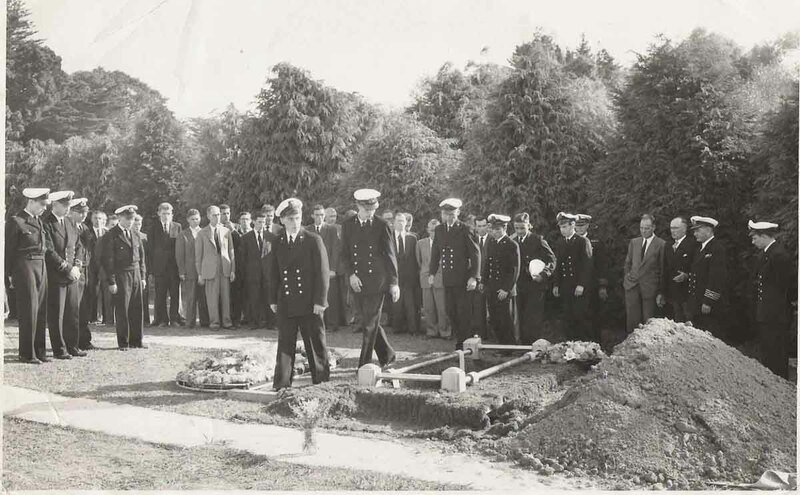 Here is a photo of the whole ships crew plus Harbour Master of Port Elizabeth NZ at the burial of our brave apprentice.